It’s impossible for us to thank you enough. Thank you, thank you for thinking of us and the remote families whom we serve, for helping us and praying for our work. We remember you in prayer every day, and we honor you as a true hero of this mission. Together, we are maintaining a strong and vital Catholic presence in this far-flung area, and at the same time, we are improving lives. Thank you! 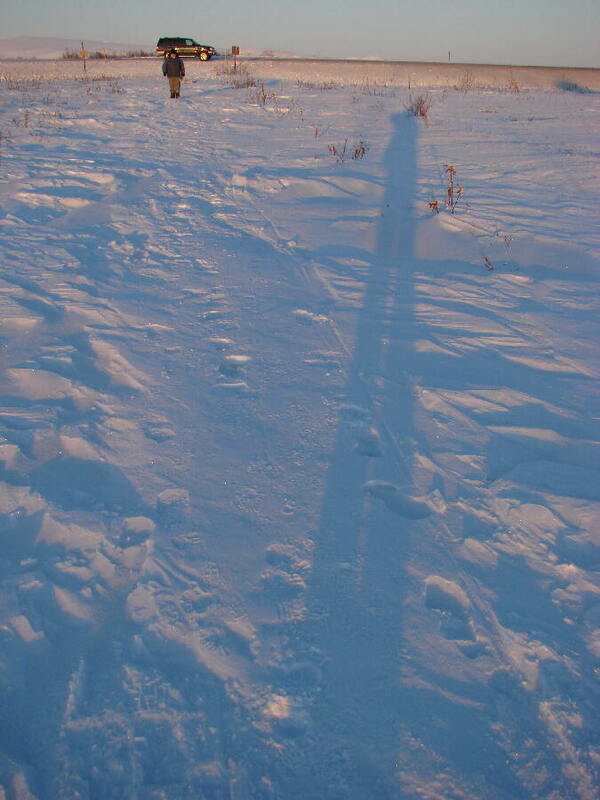 (Left) THE FINAL 400 FEET to the KNOM transmitter can be rough, but not today, as Les Brown prepares to walk from the gravel road, 3 miles east of Nome. 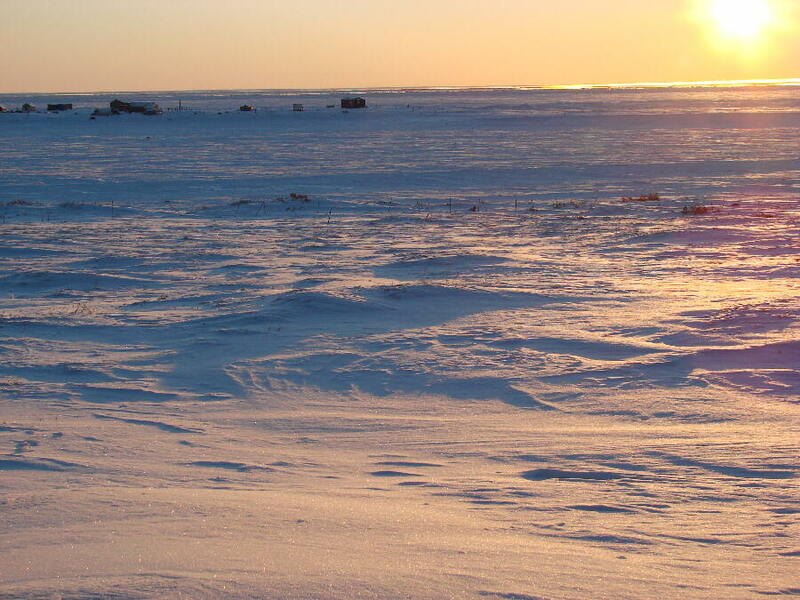 It’s a calm and relatively mild January 2009 day, –20�, with the noon sun about 3� above the frozen Bering Sea. Next to the generator building a few days earlier, general manager Ric Schmidt fell through the snow above his waist, and struggled to right himself. “I had to flop out,” Ric says. (Left) The reverse angle on this crisp January day. Remember that the sun is at its highest point for the day, and note the angle of the photographer's shadow. Every KNOM engineer over the years has at least a couple of stories. When she was a teenager, business manager Lynette Schmidt remembers a story her late brother, Br. Normand Berger, FIC, told, of a harrowing trip back from the transmitter. There was so much snow on the air that the road was completely invisible from the driver's position, and he walked in front of it, with fellow Brother of Christian Instruction, Br. Raymond Berube, FIC, at the wheel. Les was a KNOM volunteer in 1972 and 1973, and starting in 1988, began spending his vacations working at the mission. Upon “retirement” in 1997, he returned as chief engineer. Now living in urban Palmer, Alaska, he flies to Nome several times a year to keep the equipment in good repair. (Left) From the steps of the transmitter building, you see about 300 feet of snow-covered tundra, then the mouth of the Nome River, the little peninsula of Fort Davis with a couple of summer shacks, and behind that, the frozen Bering Sea. GOT A MATCH? Do you work for a company which matches charitable contributions? If so, you may be able to double your gift. Due to KNOM’s strong educational, cultural and social components, some companies which do not ordinarily contribute to religious organizations do give to us. INSPIRATIONAL SPOT: Hard times are the grit which heaven uses to polish its jewels. INSPIRATIONAL SPOT: God will always find you. No matter what problems you’re facing, or how far you think you’ve drifted away. God will find you. Take time each day to acknowledge the Lord’s presence. 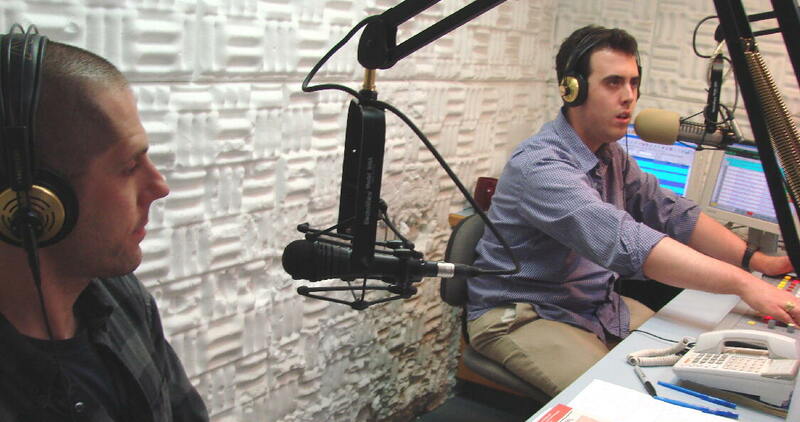 APPLY TOPICALLY: (left) At left, news director Paul Korchin assists volunteer inspiration director Dave Dodman in conducting a call-in program. KNOM’s call-in shows are serious business, dealing with issues and subjects that are important to far-flung western Alaskans. Past programs have dealt with alcoholism, child sexual abuse, education and safety. Others talk about Alaska Native traditions and their preservation. Recently, an animated program invited listeners to share their recipes for akutaq (ah-GOO-tuk), commonly known as “Eskimo ice cream.” Typically, it’s a treat made of fish, tundra berries, sugar, and some kind of fat, depending on the location — seal oil, reindeer or walrus fat, or shortening and vegetable oil. There are as many variations as there are families. Our listeners’ opinions vary, but unlike many talk radio programs elsewhere, the conversation always remains respectful and participants honor each others’ dignity. 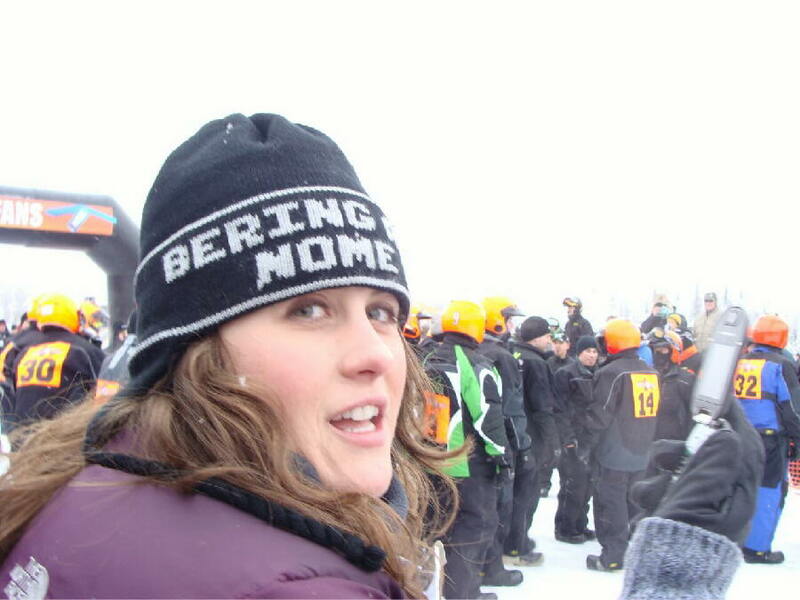 IRON DOG: (left) It's been months since she left her six-year award-winning time with KNOM, but February 8th, Amy Flaherty volunteered to give front row seats to KNOM listeners for the exciting start of the Iron Dog snowmobile race. Amy reported via cell phone as racers left Big Lake, just outside of Anchorage. At 1,900 miles, the Iron Dog is the longest snowmobile race in the world, through some of Alaska's toughest and most remote country. It follows the Iditarod Race's route to Nome, then doubling back and following the Yukon and Tanana Rivers to Fairbanks. Incredibly, last year's winners traversed that route with a trail time just over 38 hours! 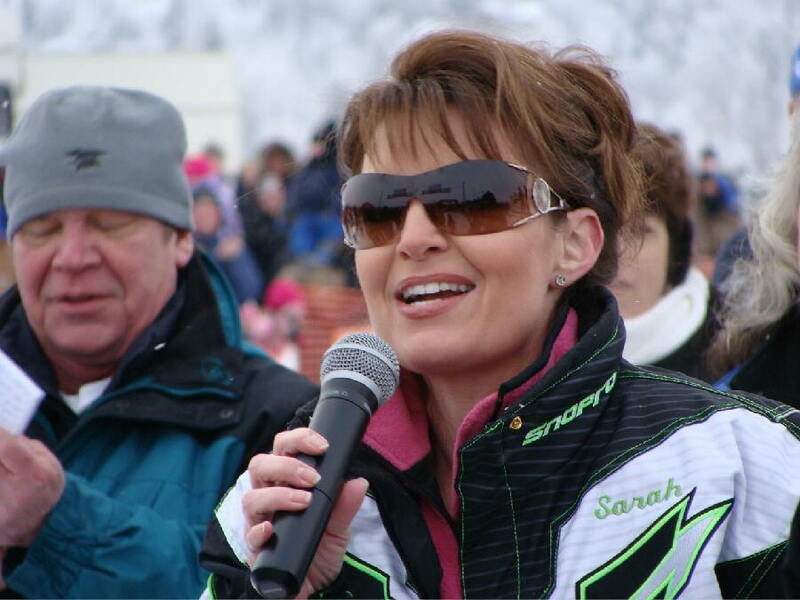 (Left) Alaska Governor Sarah Palin spoke at the start. Her husband Todd, a past winner of the event, was a contestant this year. We offer thanks to former KNOM volunteer Anna Dummer, who took these photos. 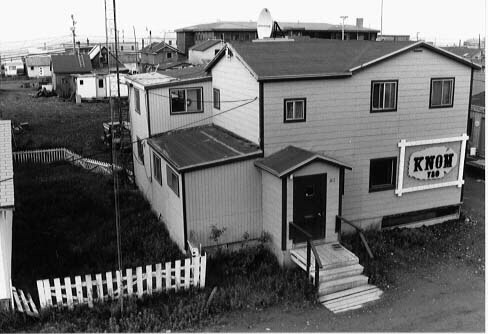 SPOT COST: Before the new Nome Catholic station went on the air in 1971, it was clear that in order to be effective, and cost effective, the mission needed to attract virtually everyone in the region to keep their radios tuned in for hours a day. Thus, a format was developed that was entertaining and informative, with most of the day’s education and inspiration broadcast in the form of short spots, like commercials, mixed in with music, news and information. The average cost of airing each spot is currently $2.76. Educational spots on the air last month addressed topics such as mining vs. conservation, cancer, self-improvement, foster children, dog bites, prenatal care, school violence, employment, law enforcement, safety, reducing stress, New Year’s resolutions, child abuse, diabetes, earth science, Alaska history, depression, vitamins, and Alcoholics Anonymous. Thank you for helping to keep these vital educational messages alive and well. Please consider including the KNOM mission in your will. You will create a legacy that will continue to improve the lives of others far into the future. INSPIRATIONAL SPOT: Lord God, our Creator, help me to create, too. Create peace by my forgiveness. Create understanding by my being open-minded. Create hope by my gentle caring. Create love by my generously serving others. TUCKED AWAY in the back upstairs of the studio building is “Studio Zed,” in which music director Laura Davis (left) often works. The room was first intended to house many of KNOM’s computers, and it still does, though as usage of other studios grew, an audio editing station was added, primarily to “dub” material, as from CDs, into KNOM’s audio computer system. The dark foam behind her covers all four walls, to absorb sound from the computers’ cooling fans. The room is relatively quiet today, but before the foam was installed, the noise was so loud that carrying on a conversation was virtually impossible. 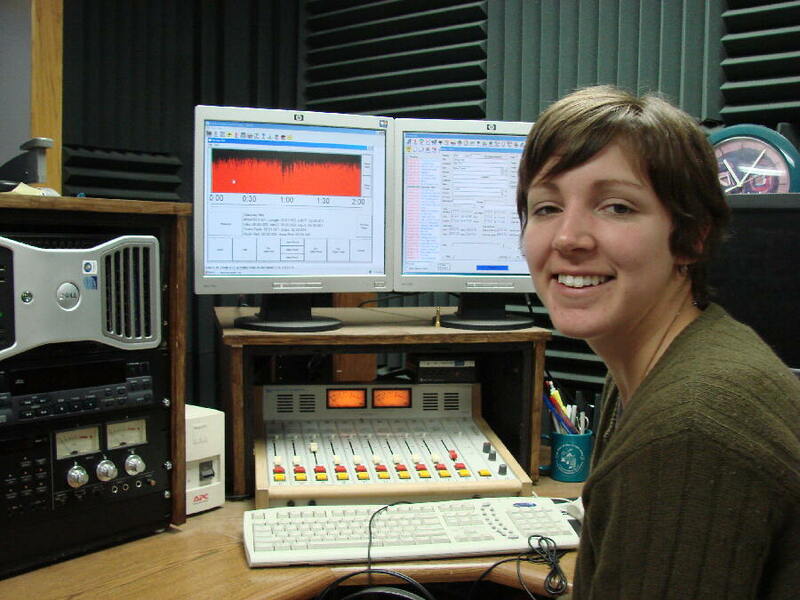 The audio mixing console she uses is 16 years old, originally installed in the KNOM newsroom. From Newport News, Virginia, Laura is a graduate of Virginia Intermont College who is in her second year as a fulltime unpaid volunteer. Thank you, Laura! MORE POWER TO US: In mid-January, the control panel on the transmitter site’s emergency generator indicated that it has run 677.9 hours since the unit was installed eleven years ago. Over that time, it’s kept us on the air for more than 28 days of power outages! (Left) The generator is refueled during a long emergency outage in January 2008. If you contributed toward that generator in 1997 and 1998, thank you! If you contribute now, you are helping to keep it in shape for future power emergencies, and there are certain to be plenty more. PHONE HOME: The next needed upgrade to the KNOM studio is a new telephone system. There are eleven phones in the building, and you can imagine that we use them a lot, for gathering news and taking announcements from listeners, among many other purposes. The problem is that the individual phones have begun to fail, and having been out of manufacture for many years, they cannot be replaced. We’ll keep you informed. INSPIRATIONAL SPOT: Today is a gift from God. Will I keep it to myself, or share it with others? TANKS A LOT: (left) Just west of Nome lies the town’s tank farm, containing almost a year’s worth of jet fuel, gasoline and heating oil. The tanks were filled in October, at a time when petroleum prices were close to their peak. 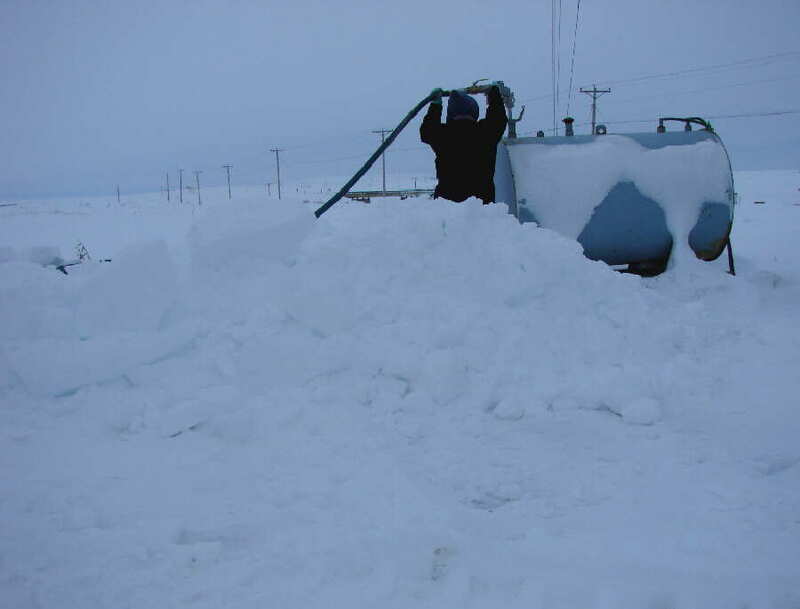 As a result, until the next shipment in July, Nome residents will continue to pay $4.99 for a gallon of gasoline, and $5.49 for a gallon of heating fuel. In remote villages, some of our listeners are paying $10 a gallon. Between 1991 and 1993, we replaced our then-dilapidated mission buildings with new, super-insulated ones. Prior to then, the old studio building alone gobbled 4,000 gallons of heating fuel a year. You can imagine how happy we are that during all of 2008, the new building consumed only 352! (Left) The original KNOM studio, a building that was added to...and added to...and added to. 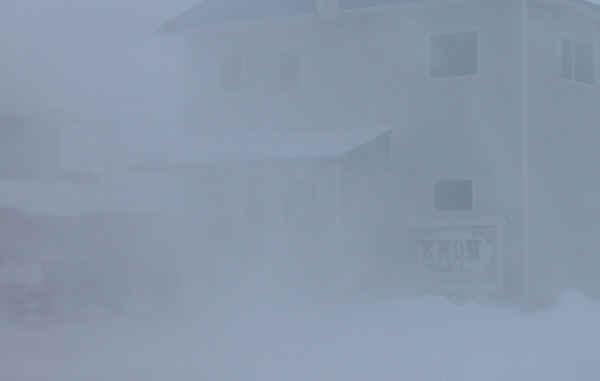 (Below, left) The 1993 newly-built Keller Broadcast Center, endures a blizzard on Christmas Day, 2004. It is named for the long gone Keller Foundation, which contributed $100,000, about one-fourth of its cost. Another donor anonymously gave $40,000. BUT OUCH! Just three years ago, electric power for our transmitter cost $62,084. In the year starting last July, this expense will have skyrocketed to more than $102,000! Thank you for sustaining us through this difficult period. TWENTY YEARS AGO: In February 1989, KNOMers are all over the map. Sean Brennan is in Anchorage, covering a visit by a delegation of Siberian Russians. Katy Clark is in the village of Unalakleet for a rural mayors’ conference. 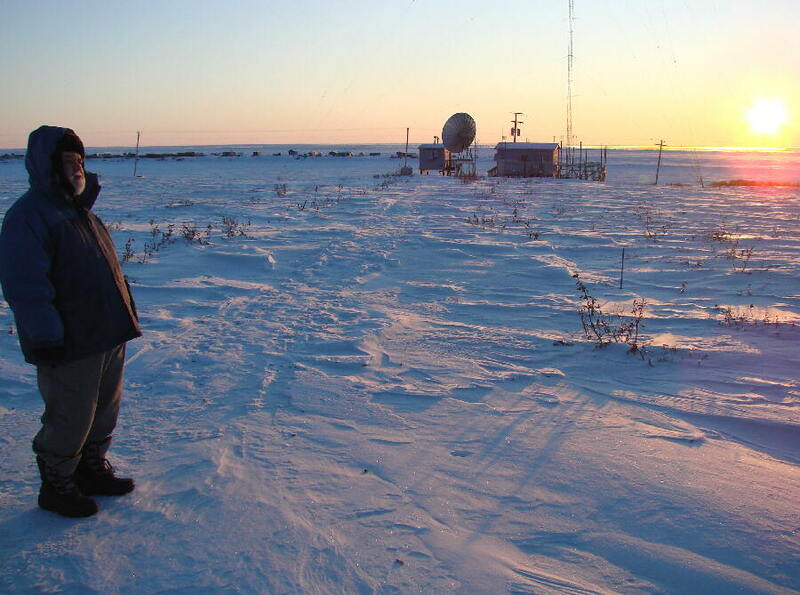 Engineer Timothy Cochran flies north of the Arctic Circle to help repair the transmitter of the radio station at Kotzebue. The weather’s bad, and news director Paul Korchin is stuck in the town of Bethel for two weeks following coverage of a sled dog race. Mike Jones takes the prize for being the farthest, 1,100 miles southeast of Nome in the capital city of Juneau to bring KNOM listeners news of an economic development conference. Much of the travel, as it is in 2009, is provided free of charge by local airlines. TEN YEARS AGO: Volunteer Kevin Glynn has been accepted by the law schools of Georgetown University, the University of Chicago and the University of Notre Dame, and leaves KNOM halfway into his volunteer year. Before his departure in February 1999, Kevin painstakingly transcribes KNOM’s library of Eskimo stories onto paper from aging audio tape. Later in the year, Kevin’s scripts, totaling about 150,000 words, will be used to re-record the programs digitally in stereo. WE LOVE VISITORS: Nome is about 500 miles northwest of the beaten Alaska track for most tourists, but we do love to meet our benefactors. If you’ve never been here, you would be surprised just how remote and isolated Nome is, and how even more remotely the people whom we serve live. We’d love to have you drop by. Once more, we thank you most sincerely for your graciousness and generosity toward our mission. We do pray for you and your intentions every day, and we honor you as a solid partner in our work. Thank you once more for your kindness and your prayers on our behalf. May Our Heavenly Father bless you and remain close to you.